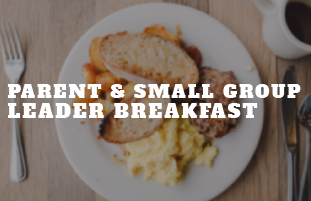 Parents of middle school and high schoolers, connect with your students' Small Group Leaders for breakfast on Sunday, March 17 at 9:00am in the youth room. The local church's best chance at influencing a student's life and faith is to connect that student's parents with other caring adults so they can support each other and work together to influence the teenager they love. Get to know the leaders of Christ Youth. RSVP by March 10 - Click here to register!